Used RE22 DNA (provided by Elene) as a positive control. 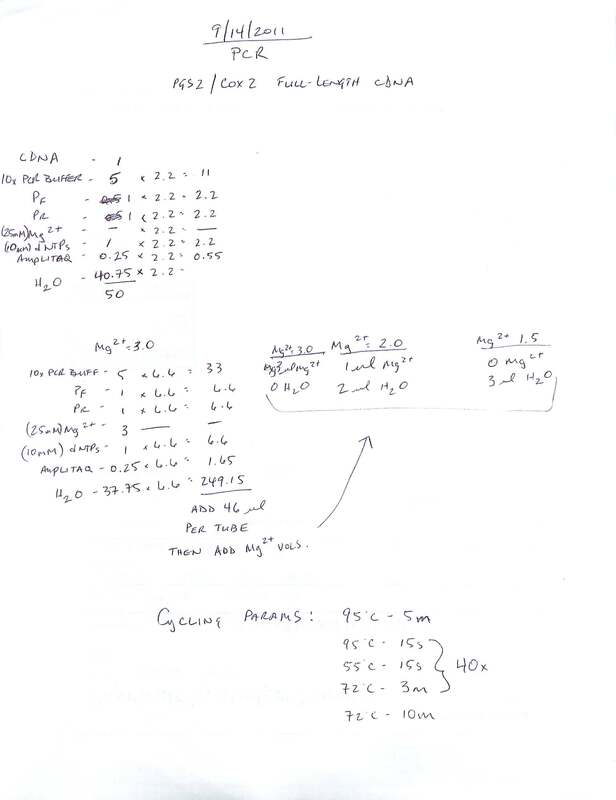 Master mix calcs are the same as yesterday’s qPCR, but using the primers mentioned above. Plate layout, cycling params, etc. can be found in the qPCR Report (see Results). All samples were run in duplicate. Positive control worked in all primer sets. All no template controls were clean for all primer sets. Only one sample (#411) produced any amplification. Amplification was detected in the vtpA primer set (mean Cq = 38.06). However, there was also amplification detected in one of the two replicates for sample #411 in the rseA primer set (Cq = 39.09). 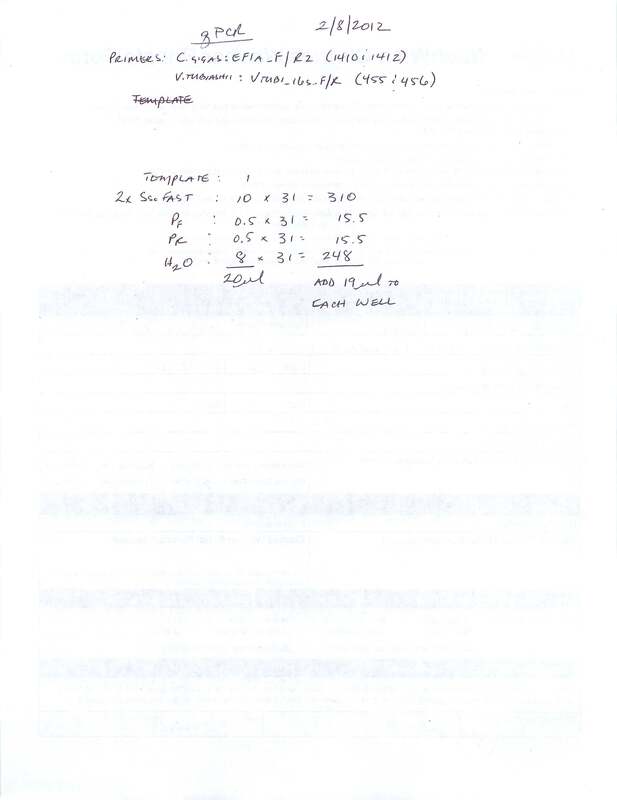 This entry was posted in Miscellaneous and tagged cDNA, CFX96, DNA, qPCR, RE22, rseA, Vibrio tubiashii, VtpA, VtpR on 9 February, 2012 by kubu4. Performed qPCR on all 12 samples. Used Cg_EF1aF/R2 (SR IDs: 1410 & 1412) for one set of qPCRs and Vtub_16s_F/R (SR IDs: 455 & 456) for the other set of qPCRs. Used pooled C.gigas cDNA (from 20110311) and RE22 DNA (provided by Elene) as positive controls for C.gigas and V.tubiashii, respectively. C.gigas gDNA (7ng of BB16 from 20110201) was used as a negative control for EF1a. Master mix calcs are here. Plate layout, cycling params, etc can be found in the qPCR Report (see Results). All samples were run in duplicate. C.gigas EF1a – Positive control amplified. Negative control and no template control were all clean (i.e. no amplification detected). The majority of samples had amplification, however two samples had no amplification at all (samples 132 & 136). V.tubiashii 16s – Positive control amplified. No template controls exhibited amplification in both replicates. All samples exhibited amplifcation, however nearly all of the melt curves have multiple peaks present, suggesting that more than one target is being amplified. I suspect this is due to residual gDNA, but this fails to explain the amplification in the no template controls which also exhibited dual peaks in the melt curves. Spoke with Steven and he suggested to skip troubleshooting the V. tubiashii 16s for now and proceed with trying to qPCR some additional V.tubiashii genes. Will talk with Elene to see if/which additional genes she has primers for. This entry was posted in Miscellaneous and tagged 16s, cDNA, CFX96, Crassostrea gigas, EF1a, gDNA, Pacific oyster, qPCR, Vibrio tubiashii on 8 February, 2012 by kubu4. This entry was posted in Miscellaneous and tagged cDNA, Crassostrea gigas, gel, gel extraction, Pacific oyster, PCR, PGS, PGS1, prostaglandin synthase, Ultrafree-DA on 21 September, 2011 by kubu4. This entry was posted in Miscellaneous and tagged cDNA, Crassostrea gigas, gel, Pacific oyster, PCR, PGS, PGS1, prostaglandin synthase on 20 September, 2011 by kubu4. This entry was posted in Miscellaneous and tagged cDNA, Crassostrea gigas, gel, Pacific oyster, PCR, PGS, PGS2, prostaglandin synthase on 14 September, 2011 by kubu4.